MERV 8 Pleated Furnace Filters | Air Filters, Inc. Looking for Economical MERV Rated Pleated Filter? 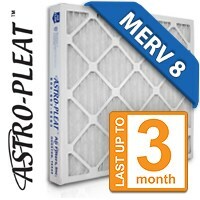 Astro-Pleat™ MERV 8 Furnace Filter offers ability to filter common airborne contaminants like pollen, pet dander, dust / lint and dust mites at economical value.